BUFFALO, N.Y. -- The "MiLBy Awards" are back as the fans of minor league clubs across the country get to vote on the best players and moments from 2018. And this year, there are a pair of Bisons up for awards… on that brought Herd fans to their feet and another that…well let's be honest, gave us a good laugh! Bisons third baseman Vladimir Guerrero Jr. and outfielder Anthony Alford are up for two very different awards. Vladdy is looking to take home the award for Top Offensive Performer while Alford is in the running for the Best Blooper of the year! 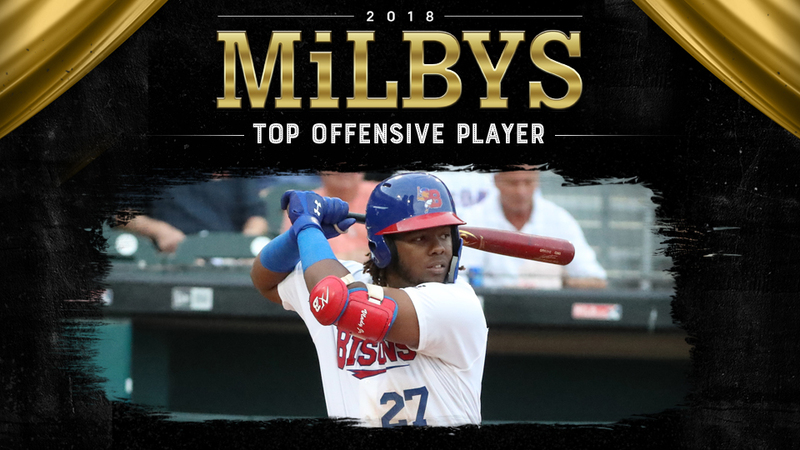 For Vladdy, he's taking votes as minor league baseball's top offensive player after an amazing campaign split between the Bisons and Double-A New Hampshire. What else can be said about a slugger that hit 32 points better than any other player in minor league baseball other than WOW. And then there's Alford, who provided a moment of great levity when he scored all the way from first base on a Reese McGuire double, albeit with a tumble and a crawl to home plate? And there's one more vote to cast. The Toronto Blue Jays are also up for Best Farm System as well.